Is it snowing in Mt Olympus ?¡Gracias! Moderate rain (totál 16.0mm), heaviest el sábado por la tarde. Very mild (max 11°C el domingo por la noche, min 8°C el viernes por la noche). Wind will be generally light. Light rain (totál 2.0mm), mostly falling el jueves por la mañana. Very mild (max 12°C el lunes por la tarde, min 10°C el martes por la noche). Wind will be generally light. La tabla anterior muestra el pronóstico de tiempo para Mt Olympus en la altitud específica de 1890 m. Nuestros modelos meteorológicos sofisticados permiten prever pronósticos para la cumbre, la mitad y la base de Mt Olympus. Para aceder a los pronósticos de tiempo a otras alturas, pinche en la navegación en la parte superior de la tabla. Para una visión general, consulte el Mapa meteorológico de Cyprus. Having just read a pretty poor review of Mt Olympus, I am peed off so will write my own. I have lived here for 3 years and only just discovered the mountain this season. It is great; plenty of snow this year, the lift pass and ski hire (own boots) was 12 Euros. Yes, 12 Euros for a day. That was the first nice surprise. Locals, expats and military folk stationed here should take full advantage. It is not a place you would come to from the UK expecting a week of skiing. 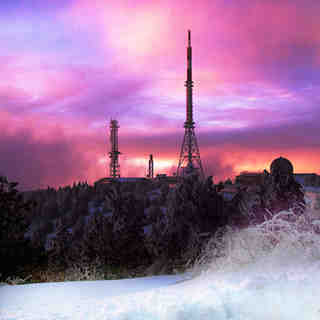 But, if you are here and the conditions are good, please go up to Troodos. We drove up in an Astra with no chains and managed to park on the busiest day of the season, a bank holiday Monday, queued for rental about 15 mins and got some fairly old skis which were perfectly adequate. 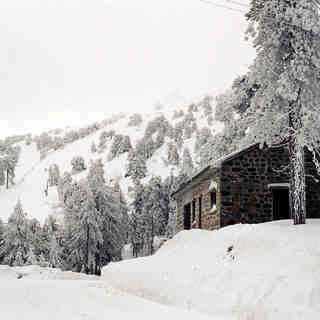 There was over a metre of snow too and the place looked beautiful with lots of pine trees covered in snow. On a later visit, this week, it had bit less snow but was still skiable. Speaking as a person who learnt to ski as a child in the very rough and ready Alpine region of Australia, Mt Olympus brought back happy memories of just skiing for fun; no need to cover a massive resort to get value from your expensive lift pass, no piste maps, no lift queues and not a go pro in sight. It ain't Val d'Isere and I love it for that. If you go you can expect to get good experience skiing in sometimes difficult conditions. There appears to be no grooming of slopes. You could learn to ski here; there are ski school group lessons for 15 Euros, private lessons for 35 Euros. I have skied in much worse condition this time of year (mid March) in Andorra, France, Italy so really I think Mt Olympus is a little gem. Beware of other skiers/snowboarders though, some people are out of their depth and can be a bit scary, i.e the inability to stop or check their speed.